One of my coworkers went to Duke. All college basketball season, I had to hear him talk about personal anecdotes of camping outside in the snow for days to gain entrance to an iconic Cameron Indoor Stadium basketball game. Repping my PLNU hoodie, I’d roll my eyes. OK, PLNU is no Duke, but my go-to comeback is that there’s nothing to do in North Carolina. They really didn’t have a choice. When the sunny SoCal weather was nice on our game days, I already knew the attendance numbers would dwindle. Students could go out and do… absolutely anything. And if the weather wasn’t nice — say, rain — no one left their sweet dorms based on the fear of the ferocious droplets. But, this basketball season, something changed — and it wasn’t the weather. I was witnessing a rise in Loma sports pride. Pictures of this season’s men’s basketball team celebrating win after win seemed to flood my timeline throughout the year. That’s when it truly clicked for me: Oh, this team is good, good. “We tried purposefully to schedule a lot of home games,” head coach Ryan Looney said about this season. “When the season had started, we may have had a couple hundred people at a game. And then we kept winning, and kept winning, and you could sense that not only the campus itself, but people in the community starting to come more and more.” But, he said, the real buzz started when No. 1 regional ranked PLNU was selected to host the first three rounds of the West Regionals of the NCAA tournament in mid-March. He continued, “I mean, I find it hard to believe there’s ever been a day where the campus has been [as] electric as those three days were. We had sell-out crowds, and people lined up outside.” Take that, Cameron Crazies! But, this basketball season, something changed—and it wasn’t the weather. I was witnessing a rise in Loma sports pride. For the tournament, everyone chose to see a basketball game while the sun was shining outside. I replayed a couple of those Instagram stories a few times back to be certain that was my old Golden Gym about to burst its seams; my school repping that green and gold as if it was going out of style; my fellow Sea Lions screaming so loud that I had to mash the volume down on my phone fearful my speakers would blow. Usually, this would be a once-per-year Homecoming game deal, but this was February and March, and the students were still showing up! Watch parties in the cafeteria and the ARC on tournament away games! Silence during free throws — virtually! School spirit! It was like a campus sports revival. Wow, this is cool. Leading up to the tournament, the senior ASB director of school spirit, John Bunnell, told me that the Green Sea was prepared to show up and show out in the student section. Acai bowls, Phil’s BBQ, and pizza boxes were continuously making their rounds before and during regular season games to build the hype and get the most people there as possible (life hack: if you want college students to go anywhere, feed them). Plus, during the West Regionals, he had planned different themed nights like Whiteout, Blackout, and Green and Gold Rush. It’s been special alright. With a final record of 31-5, the Sea Lions match the most wins in PLNU men’s basketball history since the 1952-53 squad. Their 14-game win streak in PacWest play propelled them to finishing first, earning the conference title, and grabbing the conference tournament championship win. It’s the program’s first PacWest title and the first men’s sport conference title since upgrading to NCAA DII in 2014-15. 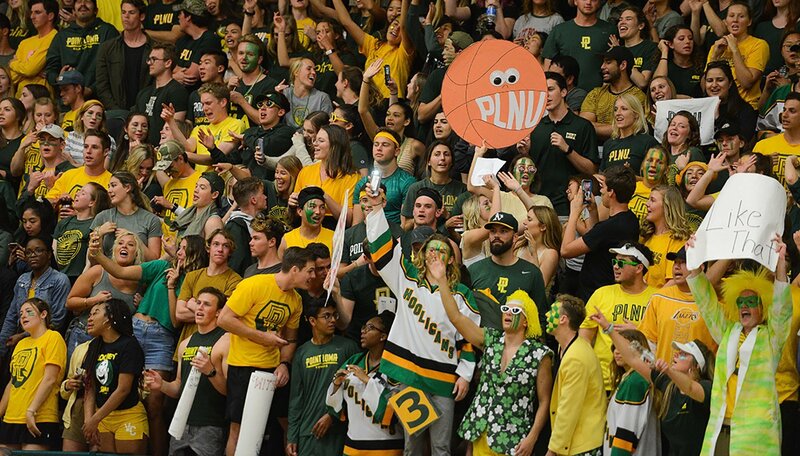 Related Article: Corey Costelloe looks back on the growth of basketball at PLNU and reflects on his own journey covering them as a student reporter. One of those players that believed was transfer Daulton Hommes. Maybe you’ve heard of him? The 6’8” junior star, who averaged 21.9 points and 5.8 rebounds per game while shooting 47.0 percent from 3, won PacWest Player of the Year and NABC DII Player of the Year. NBA scouts heavily sought him out, and now he’s trying his luck in the 2019 NBA draft. The kid can ball. There will be a legacy that will live on a lot longer than the initial heartbreak of a tough loss. A legacy that is associated with so many firsts attached to it. The single-site record 18,870 fans at the NCAA DII Elite Eight games in Evansville, Ind., know about Sea Lion basketball now (and they probably all Googled our campus and immediately felt envious. See, we still win!). A small liberal arts school that hailed from the hills of Pasadena to bringing home hardware to the seaside of San Diego — we’ve come a long way. The best part is, we’re only getting started. A small liberal arts school that hailed from the hills of Pasadena to bringing home hardware to the seaside of San Diego—we’ve come a long way. The best part is, we’re only getting started. The Monday after the championship game, there was a true homecoming celebration. The campus worked together to commemorate the basketball team and to show the pure delight that I’m trying to convey through these written words. In and after chapel, a last-minute planned parade ensued with the team riding down Caf Lane in decorated stake trucks. “Even though we had lost, we wanted to honor the basketball team and show them how much the students, community, faculty, and staff appreciated them and love watching their games all season,” Bunnell said. “We wanted to show them how special they are to our Point Loma community.” The PLNU commencement bell made an appearance, a DJ cranked some tunes, and the campus was adorned in perfectly hued forest green and sunset gold while students and staff rallied and celebrated the truly victorious season that had come to an end. What a run. So, Loma, keep cheering. 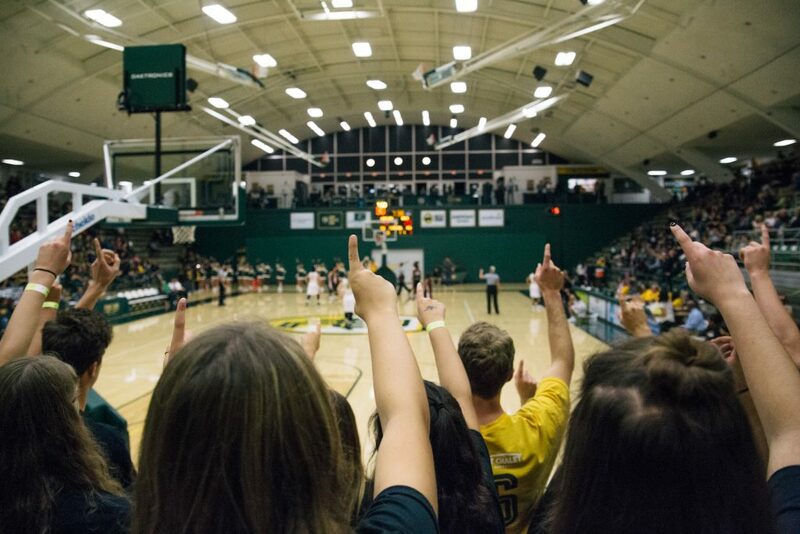 Keep supporting PLNU sports, and we’ll see you next season in Golden Gym—same place, our time. Jordan Ligons (16) is a former PLNU women’s basketball student-athlete and studied journalism and women’s studies. Currently, she’s a journalist for The Ringer, a sports and pop culture website, in Los Angeles, CA. 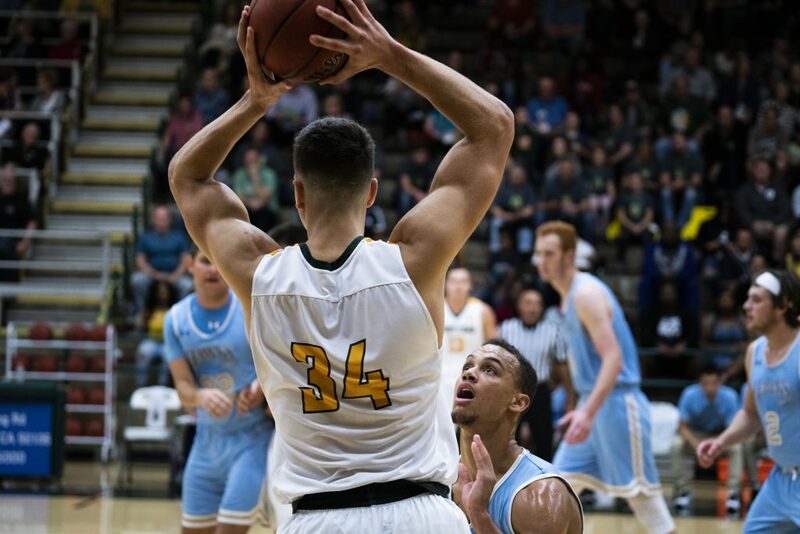 Related Article: PLNU alum and professional U.K. basketball player Drew Lasker on basketball, PLNU, and faith.